In Part I of this series on zone starts, we discussed how coaches’ are limited in their ability to completely control line deployment, particularly when we talking about only offensive and defensive zone shift starts (which make up a very small portion of all shift starts), as well as why the difference between zone starts and shift starts further muddies the relation between metrics like ZSR or OZS% and the actual intention of the coaches. I hinted at the end that while starting in a specific zone has a large effect on the shot metrics for that particular shift, the overall effect of zone starts on measures like Corsi and Fenwick is actually quite small. In Part II of this series, we’ll explore why that is the case, and discuss how metrics that adjust for zone starts function. A note on terminology: in an effort to use terms that better encompass the events that they are meant to describe, I will be using terms in this article that don’t necessarily match those most commonly used. For example, as a disciple of Micah Blake McCurdy’s methods, shots* (with an asterisk to remind you when reporting actual numbers) will refer to what are commonly called shot attempts – that is, every time a puck is shot at the net, regardless of whether it hits or misses. “Unblocked shots” will replace unblocked shot attempts (also known as Fenwick), missed shots will replace missed shot attempts, and shots-on-goal will replace shots. Furthermore, I’ll be endeavoring to resist using the term “possession” when referring to on-ice shot metrics, preferring to use “shot shares”, “shot differentials”, “shot ratios” and the like. While on-ice shot metrics have long been a proxy for possession, research comparing the two has found that not only are they less correlated than we’d assume them to be, but that shot metrics are actually better indicators of future goals and wins – in other words, they are more meaningful than pure puck possession. Please bear with me as I try to join the movement to making fancy stat terms more intuitive. The connection between zone starts and shot shares (Corsi, Fenwick, etc) is easy to imagine: if you take a faceoff in your zone, you’re more likely to surrender shots against; if you take a faceoff in the opposing zone, you’re more like to generate shots for. Micah Blake McCurdy of hockeyviz.com took this analysis a step further and mapped out shot rates based on time from the beginning of shifts. This is an eyeful at first, but it contains some fascinating revelations. However, that spike lasts a very brief period of time. By far the biggest effect occurs within the first 10 seconds. By 15 seconds after the drop of the puck, we’re looking at a difference of about 20 shots* per hour (one shot every five seconds), and by 20 seconds, the effect is almost nonexistent. All lines converge and eventually begin to separate after about 40 seconds. At this point, all the for rates are grouped together, and all the against rates are grouped together. The longer the player stays on the ice, the more their for rate decreases and their against rate increases. The longer a player stays on after 40 seconds, the worse their shot metrics will look. With the most common shift length being 53 seconds (as found by McCurdy), players are constantly staying out long enough to begin erasing the benefits they saw by starting in the offensive zone, and the longer they stay out, the more likely it is they get trapped – and then things can really get messy. I’ll offer my apologies if all of this is just adding to the level of confusion. This is simply the groundwork while the real evidence of the effect of zone starts lies in the aftermath of formulas that adjust for them. The solution to taking into account zone deployment without letting it provide more influence than it deserves is to use zone adjusted adjusted shot metrics. 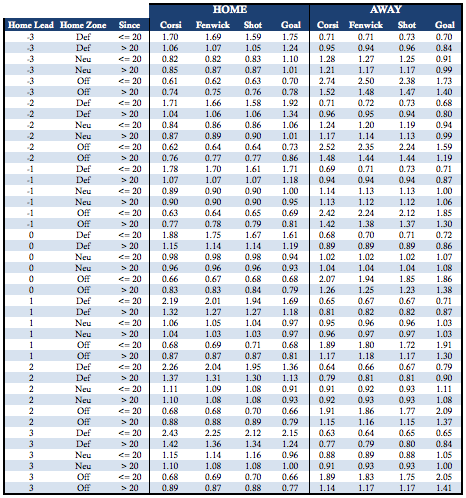 There are several different adjustments out there, though many of them rely on the same methods: determine the amount of shots that occur in shifts starting in various zones, and use the varying totals to apply coefficients to individual shots. Matt Cane did this in his article on the subject, as did Micah McCurdy. Of all the players in the league in 2014-2015 with 100 minutes played at 5v5, only 5% of them them see their on-ice shot percentage move more than one percentage point. The formulas that we’ll focus on are those of Emmanuel (Manny) Perry – as the webmaster of Corsica, his numbers are widely available and thus they make the most sense to use – and they will show a slightly result (though similar) result. Perry’s are derived based on Micah’s methods and discoveries, but his formulas include a significant addition: they factor in Micah’s assertion that the effects of zone starts are largely contained in the first 20 seconds following a faceoff. As such, events that occur within 20 seconds of a faceoff are weighted differently than events that occur more than 20 seconds after a faceoff. As you can see, the vast majority of adjustments are within two percent, with some outliers in either direction. Like I said, the results are a little bit different – Perry’s formula causes adjustments that are somewhat higher than Micah’s simpler formula – but the overarching conclusion is still the same: zoen starts do not have a great effect on shot metrics. Let that sink in: Paul Gaustad, who took 387 more faceoffs in the defensive end than the offensive zone had the Corsi-For percentage of his entire 2015-16 adjusted up by just seven and a half percent. That is why claims like “Sure, Horvat’s CF% is only 44 percent, but look at his zone starts!’ don’t hold much water. The difference between Horvat’s score adjusted CF% and score and zone adjusted CF% in October was just 0.78. Horvat, who took 17 more defensive faceoffs than offensive faceoffs in October, has a long way to go to reach Gaustad levels. You might be wondering why the adjustment is so small, given that the chart at the beginning of this article showed such large benefits for individual zone starts. The explanation for the discrepancy is the sample size problem that I noted in Part I: offensive and defensive zone starts make up only a small portion of all players’ shifts – the rest of them, neutral zone faceoffs and on-the-fly changes, regress the personal metrics back towards the individual player’s natural capabilities. At season scales, for almost every regular player, zone starts don’t matter. 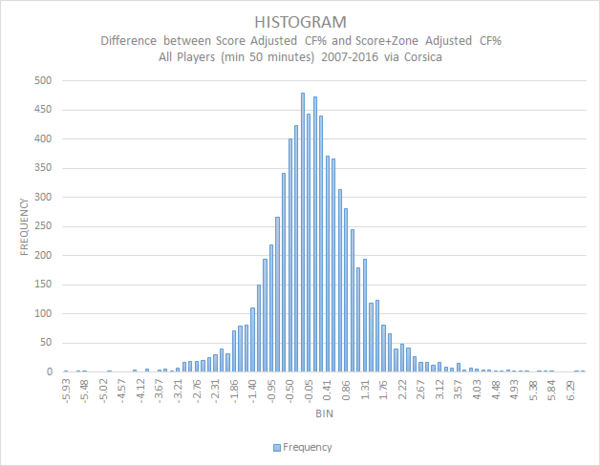 Now that we’ve seen what the data says about the average NHL player, in Part III, we’ll analyze how individual ability helps move the needle when it comes to zone starts, even if the overall effect is small, and why determining which players should frequently start in which zones is not as obvious as it seems on the surface. Good stuff, this series has been quite informative. Im not 100 percent on board yet, but the data you are putting forward definitely has a lot merrit. this is interesting. i don’t understand the shots per 60 minutes axis ranging from 60-160 shots unless you are counting shots for both teams. that seems too high to me to be 5v5 shot rate for a single team. if it is the shot rate for both teams the metric seems to be to be watered down because we are trying to track whether the effect on the rate of shots per minutes for the team taking offensive zone face offs is meaningful. also, what you are showing is that there is a high likelihood of a shot immediately after an offensive zone faceoff with a sharp drop off after that and a gradually increasing likelihood of a loss of possession and an offensive push in the other direction. this makes sense to any hockey fan. but i don’t see how that leads to a conclusion offensive zones starts don’t matter. it actually appears that the ten seconds after an offensive zone faceoff is equal to multiple times that amount of ice time on a shift commencing on the fly or in the defensive zone in terms of shot for potential. which makes sense to any hockey fan. and which would make offensive zone starts important in assessing corsi. so if you are regressing that to be meaningless over a season then it seems you are doing it wrong or your sample sizes are too small. which brings me to your comparison to shots for trailing vs. ahead. the problem with this comparison is that i am pretty sure teams trailing tend to have more offensive zone face offs and that the players who tend to get a lot of offensive zone starts get them even more often when trailing. so you are comparing it to a stat that is already tweaked for offensive zone starts. so you would expect the impact on that stat to be less. a trailing team won’t necessarily have more offensive starts. They’re trailing because they’re on their way to getting beat.